The Alliance of Professional Health Advocates (APHA) is now listing SOUL SHERPA’s (R) updated contact information, including photographs and our logo. Offices in California and NevadaSOUL SHERPA provides all aspects of patient healthcare advocacy to clients from the wealthy to the needy, throughout the United States and with offices based in Southern California and Northern Nevada. Send an email to this advocate. SOUL SHERPA (R) provides expert, proactive, 24/7 patient healthcare advocacy for all individuals expressing need for its services. Twenty-five years of experience have allowed SOUL SHERPA (R) to hone the art and science of successfully crafting and executing strategies addressing various medical, emotional support, legal, and financial challenges facing each of its clients. Founded in 1990 by Lisa Berry Blackstock, SOUL SHERPA (R), who underwent successful brain surgery in 2007 for trigeminal neuralgia, this healthcare advocacy company understands first-hand the complexities of a proper diagnosis and treatment, and well as pain management and recovery. Well versed in dealing with medical insurance companies regarding denied claims, Lisa appealed her own initially rejected claim with Blue Shield of California and won. Lisa works effectively with people as a team, is empathetic but firm as a reliable advocate. She volunteers at a major Los Angeles-based medical center weekly, as a patient and family care volunteer. Understanding the inner workings of a major hospital gives Lisa an advantage in her work as an experienced advocate. Should clients request overnight stays at a hospital, SOUL SHERPA (R) provides this service. A client’s discharge procedure and transition to home or healthcare facility is something SOUL SHERPA (R) thoroughly oversees. 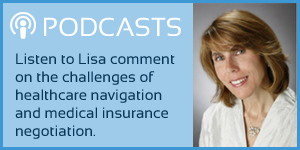 Lisa tailors her health advocacy services to suit the unique needs of each client. SOUL SHERPA (R) has had the privilege to assist clients ranging between the ages of 49 and 102. Every day of the week, and especially on weekends, Lisa is amazed and grateful for the calls and emails she receives from people all over the country searching for patient advocacy and life care planning assistance. SOUL SHERPA (R) values its listing in the ADVOConnection membership, and is always available to assist and refer clients so their needs can be met in today’s challenging healthcare and economic climates.